This article explains the benefits and uses of eight plants (herbs) that are wonderful for helping support your heart health. Find out which herbs are best for a healthy heart and circulatory system. Several years ago, I visited a doctor because I had a urinary tract infection. But, WHOA! When the nurse took my blood pressure reading, it was 176/121! The doctor freaked out! She about admitted me to the hospital.....but, I said, "NO WAY!" My Great-Grandma (who lived to within a couple months of being 100 years old) always said, "Stay out of the hospital. They will kill you in there!" I have taken that to heart all my life. I refused to go to the hospital that day. The doctor wouldn't let me leave without giving me something to lower my BP immediately, though. I felt sick because of the medication she gave me that whole day. After that, I started doing my research on heart health! Did you know cardiovascular disease has become the leading cause of doctors visits and hospitalizations? And that over 650,000 people die every year from some sort of heart issue? And that cardiovascular disease is the leading cause of death for both men and women? I've become quite interested in heart health and especially blood pressure lately, and that's because my blood pressure readings have been considered in the "high" range for some time--years, actually. I've managed to get my readings down to normal (systolic) and into the pre-hypertensive range (diastolic) by using certain herbs every day, as well as engaging in some healthier lifestyle habits. Most people are well aware of the typical life style changes that will positively affect blood pressure: exercise, losing weight, eating healthy foods, etc. But not too many people are familiar with the fact that by adding an herbal element to your daily life, you can truly impact the overall health of your heart: and that includes your blood pressure! Did you know cardiovascular disease has become the leading cause of doctors visits and hospitalizations? And that over 650,000 people die every year from some sort of heart issue? And that cardiovascular disease is the leading cause of death for both men and women? Not too many people are familiar with the fact that by adding an herbal element to your daily life, you can truly impact the overall health of your heart: and that includes your blood pressure! Here are 8 Herbs That are GREAT for Your Heart! A quick note on using herbs----They work! But there are some things you need to know about using them correctly. Here is an article I wrote a while back about things you can do to help your herbs of choice work for you--and reasons why they may not work well, too. Hibiscus petals create a lovely bright red tea from the dried petals of the hibiscus flower. This beautiful plant grows in warm (especially tropical) regions. In Iran, it is a traditional beverage, known as Sour Tea, and in England, it is known as Red Sorrel. It is a common herb in many commercial tea blends because of its tart and delicious taste. There has been a great deal of clinical research on hibiscus and its effects on the heart, specifically lowering blood pressure. To use as a tonic, just drink two great cups of this delicious tea per day! I've included a recipe using a great deal of Hibiscus (my Solstice Tea) in my eBook, Learn to Create Your Own Herbal Teas for Pleasure and Health,. You can also combine hibiscus petals with some of the other herbs listed below for a truly impactful tea! Hibiscus is considered Generally Recognized as Safe (GRAS). However, as with all herbs, you should consult a medical professional before use. If you want more of the science, ou can find some interesting scientific facts about Hibiscus and the heart in this article published in the Natural Medicine Journal. Hibiscus petals are clinically proven to support your heart and blood pressure. Hawthorn leaves, berries, and also the blossoms are useful as cardiovascular health herbs. This is because they contain a high level of flavonoids, especially proanthocyanidin, which has excellent health benefits for the heart. Scientists believe the action Hawthorn has on the heart is mainly to help dilate the arteries, which helps blood flow. Hawthorn also is useful to protect the heart during exercise, as it strengthens and tones the cardiac muscle and enhances contractions of the heart. It's a traditional medicine in Europe for congestive heart failure. Hawthorn, when used in conjunction with pharmaceuticals for blood pressure, may actually improve the effects of the medication. Therefore, it's important to discuss its use with your doctor if you are taking heart medications You can find out more in this article! Hawthorn happens to taste delicious as well! Oh, beautiful, red, delicious Rooibos Tea---it's one of my favorite teas. It has a light, woody, slightly sweet taste that I think is absolutely lovely. It's color is lovely too: when it's roasted, it has a beautiful reddish color. Quercetin is the main element in Rooibos among many others including minerals and anti-oxidants, that helps lower blood pressure, reduces inflammation in the system, and has positive effects on cholesterol. Rooibos is low in tannins and contains no oxalates, which is great if you are prone to kidney stones. So have a cup or two of Rooibos a day! Learn how to blend your own teas for pleasure and health! This eBook covers everything you need to know to start making your own tea creations: Plus recipes! As the name implies, Motherwort is typically a woman's herb, helping balance the system. However, it's great for men, too, especially when used for tonic cardiovascular health. This is because it contains leonurine, which is a vasodilator. It's also a nervine, so it helps calm and tone the nervous system, helping with anxiety. This in itself can help with issues of the heart. It is better to use Motherwort in tincture form, with alcohol as the solvent, due to the fact that the alkaloids which are what helps the heart, are soluble in alcohol, but not water. Therefore, although useful as a female tonic tea infusion in water, if you want to use it to benefit your heart, please use it as a tincture. You can find out more about making tinctures in Rosemary Gladstar's excellent book, Medicinal Herbs, A Beginner's Guide, or take a look at my article (with a recipe for a nerve tonic tincture) on how to make tinctures. You can just substitute the Motherwort for the herbs in the recipe. Contraindications: If you are pregnant or nursing, you should absolutely check with your doctor before using Motherwort. There is a great deal more scientific information in this article about Motherwort as well as elsewhere. Always do your research before taking herbs! Ginger is one of those herbs you should have in your kitchen at all times. It has a TON of uses, besides being terrific for heart health. Ginger helps heal inflammation throughout your entire body, and for the heart, its benefits are quite significant. It contains compounds similar to NSAIDS (anti-inflammatory medications) that work on body systems naturally. There is more information about the scientific studies in this article. To use Ginger to help your heart, it's best to use the actual Ginger plant. Just cut an inch long slice, cut off the tough outer skin, and brew yourself a tea. You can also use it in your cooking, as it's a delicious culinary herb. I like to cut some Ginger slices and add it to my water with a touch of vinegar. The juices are extracted into the water throughout the day. It's a nice tea infusion. If you like, you could add a slice or two to one of the herbs mentioned above for a delicious and healthy tea blend! You can also use commercially prepared powdered Ginger, but the actual plant is best as it is fresh and more powerful. 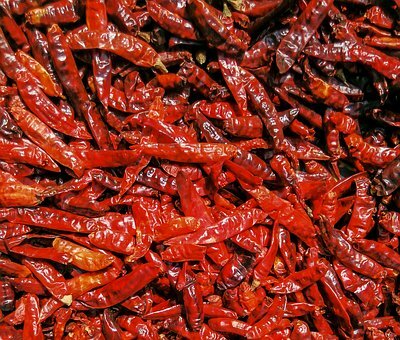 These are dried Cayenne peppers. Generally, they are used in powdered form for medicinal purposes. Cayenne Pepper is well-known to help the circulatory system function well. It detoxifies and purifies the blood, while helping with blood flow. Cayenne has a dilating action on arteries, so it's useful as a daily tonic to strengthen and tone. It's also known to reduce cholesterol. Cayenne works so powerfully on the circulatory system that it is touted as being able to stop a heart attack! You can take 1/2 teaspoon and place it under the tongue, or, if you want to be really prepared, like me, you can make a tincture and have it ready to go for emergencies. For daily use, you can cook with the powder if you enjoy hot, spicy tastes. You can add it to tea blends too. Here is a recipe for my wildly popular Rosy Chocolate Chai Tea that contains Cayenne. In the recipe it's optional, but if you want to start using cayenne daily, this tea is delicious! Find out more about Cayenne Pepper as an emergency clotting agent as well! Celery is a great diuretic! Therefore, if you eat about three or so stalks a day, it potentially will help reduce your blood pressure. It contains phytochemical that help relax the muscles around the arteries, thereby helping reduce blood pressure. In fact, it's one of the best plants used in Traditional Chinese Medicine (TCM) for blood pressure and cardiac issues. Source Besides that, it burns negative calories, so it's also great for weight loss! Burning negative calories simply means that it takes your body more energy to digest celery than the caloric value you get from consuming it. Isn't that great! What doesn't garlic do for your heart? It seems to be the wonder herb that's available to everyone! It lowers cholesterol, improves the thickness of blood (which helps blood flow), helps lower mild high blood pressure, and promotes the blood's ability to clot. Garlic is so easy to take, too! Use it liberally in your food, take a spoonful of minced garlic daily with a bit of honey! I know it sounds gross, but it's not bad! Although you can add it to your teas if you want, I don't recommend it for taste reasons. I just love the pungent aroma of garlic, don't you? Where Do I Get My Herbs? Although I'm able to grow many of my own herbs (like Cayenne, Hawthorn, Celery, and Garlic), I need to purchase some of them. I have found after many years of experience it is best to find a quality online supplier of bulk herbs. The links in the article are for Amazon, which carries a good variety of choices. For our herb purchases, I generally buy from Starwest Botanicals because of their wide range of choices in size and quality. They also have high quality culinary herbs available as well as fresh tea blends too! There are many great natural remedies you can use to improve the health of your heart and circulatory system. It's so good to know that God has provided us with all we need for our health, and these beautiful plants have never been more available to us as they are these days. I hope you'll decide to try some tea! Hugs & Health to You, and Self-Reliance! P.S. If you haven't done so yet, I hope you'll sign up for our weekly newsletter and never miss a thing! When you do, you'll receive a free copy of my eBook, "How to Use Herbs to Relax." It's filled with lots of different ways herbs can easily help you to relax at the end of the day. Disclaimer: I am NOT a medical doctor or medical professional. In no manner, stated or implied, is any statement in this article, elsewhere on my website, or in any products I sell meant to cure, treat, diagnose, or prevent any health condition. They are simply my own personal opinion based on experience, research, and study and are for informational purposes only. You should always seek medical advice from your doctor before using any herbs for health reasons. Jul 23 Golden Beet & Turmeric Kvass---A Fermenting Success! How to Make Golden Beet Kvass!